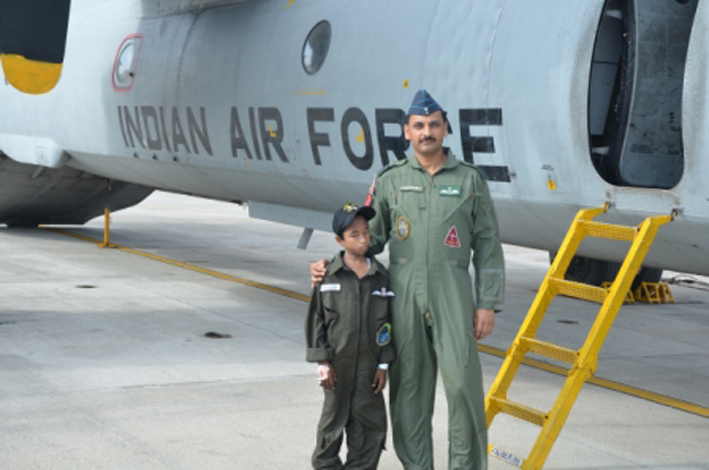 A 11-year-old boy became the youngest honorary pilot for the Squadron based at Air Force Station Sulur as station air warriors got together to fulfill his wish on 08th July. Mukilesh was diagnosed with life threatening illness Thalassemia and is undergoing chemotherapy treatment at GKNM hospital Coimbatore. 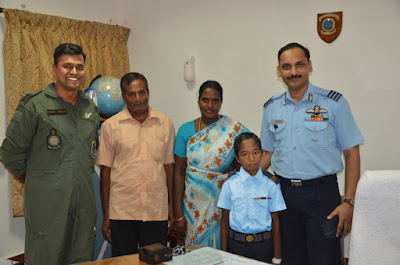 It all started with a request from Make a wish foundation Local coordinator requesting Air Commodore Umesh Kumar Air Officer Commanding of Air Force Station Sulur to help fulfill Mukilesh’s wish to become a pilot for the day. True to the spirit of IAF the request was readily accepted and 33 Squadron was given the responsibility to host the” Pilot for a Day” program for the child. 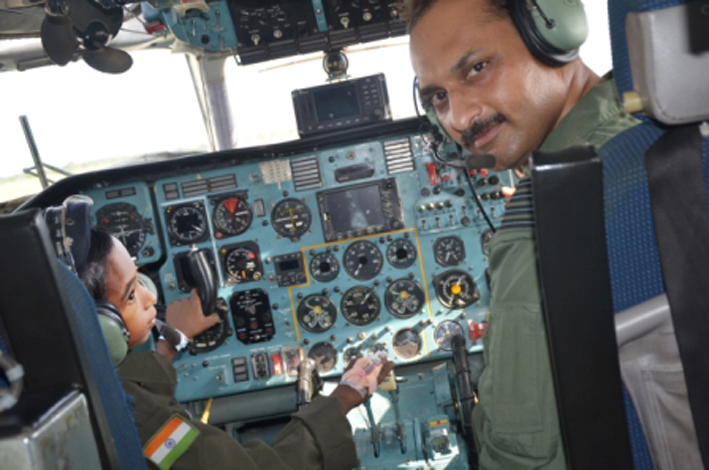 Mukilesh’s experience as a pilot for the day began when he met the Commanding Officer of a Squadron Group Captain SK Gupta. He was accompanied by his Parents, Ms Anita local coordinator of Make a wish foundation, Dr Balaji Director Coimbatore Cancer Foundation and few volunteers from the foundation. Then he met with members of the squadron who gave him a very warm welcome. 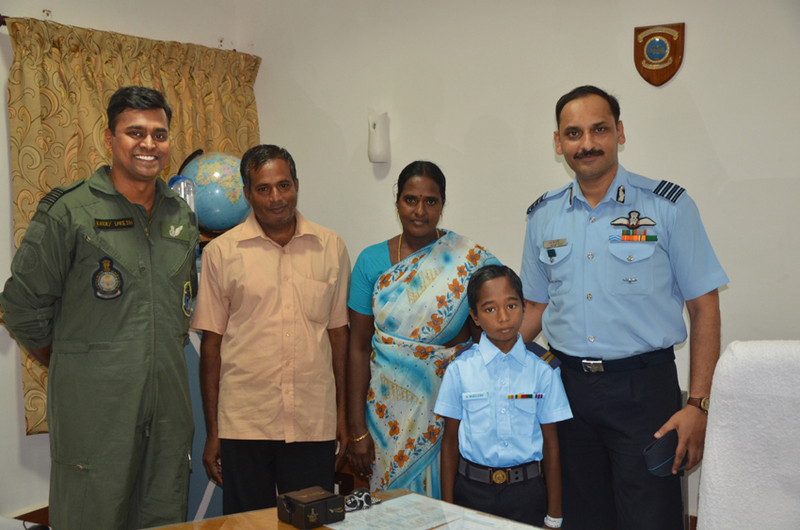 Mukilesh was given the flying overall with squadron badge and cap and above all, the Commanding officer presented him with the “PILOT WING” which Mukilesh proudly wore on his flying overall. The moment indeed lifted his spirits and brought tears of joy in his parent’s eyes. After interaction with the members of the squadron he was shown the squadron museum to acquaint him with the rich history of the squadron. To make his experience near real, before taking him to the aircraft squadron prepared a preflight briefing for him. The first slide showed his name as Captain of the mission. He, sitting next to his parents, intently listened to probably one of the most interesting pre flight briefings of the squadron delivered by Flying Officer Bala. During the briefing, on various queries by the squadron members he came up with very smart answers, which impressed all attending the briefing. At the end of the briefing he confidently replied to the Commanding Officer that he is ready for the mission. Seeing the “JOSH” in the child Commanding Officer himself took him to the aircraft. 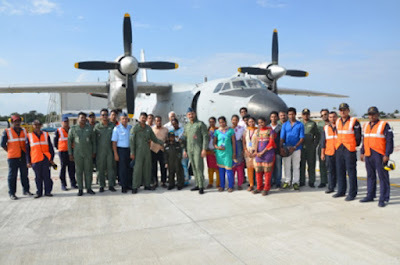 On reaching the aircraft, he was greeted by all the maintenance crew of the aircraft along with Flight Lieutenant Daljeet the Engineering Officer of the Squadron. His happiness was at peak when he was made to sit on the captain seat of the aircraft. He was also given chance to communicate with ATC of the base. Latter he was also taken to the prestigious SARANG helicopter display team of IAF. He was received by the unit members and Group Captain Abhyankar VM Commanding Officer of the unit. He was also shown the helicopter, which he thoroughly enjoyed. Mukilesh’s day was wrapped after a get together with all sqn personnel. "I think this was a great experience for him," said Mrs Kavitha, Mukilesh’s mother. "I'm sure he'll talk about this for days, especially after he takes a nap and recovers from everything he got to do today." "I think it was really important for us to do this for him after everything he's gone through so far in his young life," Wing Commander Karry Lokesh said who coordinated and conducted Mukilesh’s visit to the station. "It was an honor to do this for him because he truly deserved this." I hope and wish our political leaders do learn from this hummane act of IAF. Full marks to the Station Commander and his team to make the child's dream come true.